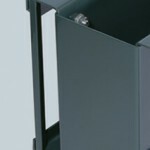 The complete bolting allows painting the columns also inside: for better protection and durability. Bolting is also produced exclusively for ROSSS with special conical bolt Class 8.8: for greater safety and ease of installation and disassembly and because it can be modified over time depending on new and different logistical requirements of your warehouse. 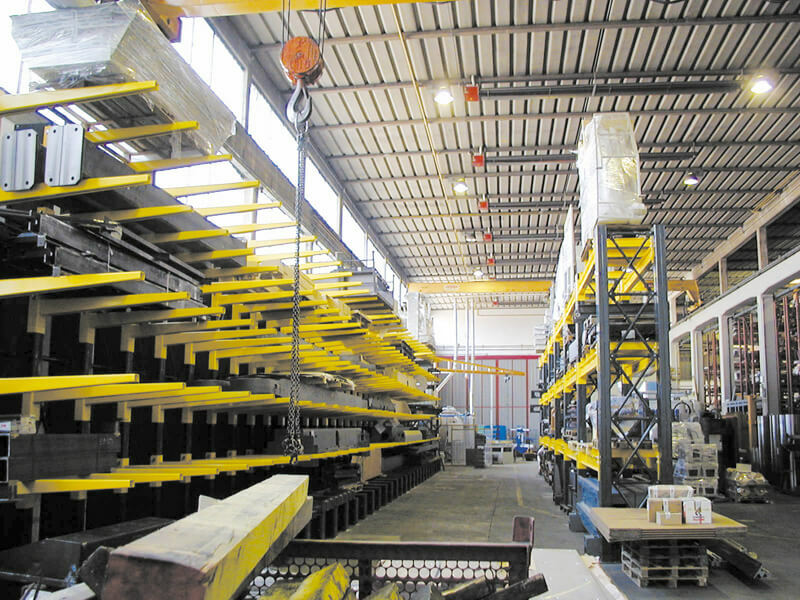 Shelving ideal for the storage of goods characterized by volumes and dimensions which can make it difficult to place them, such as bundles of pipes or boards, profiles, but also suitable pallets and metal containers. 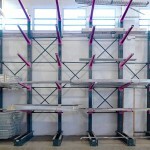 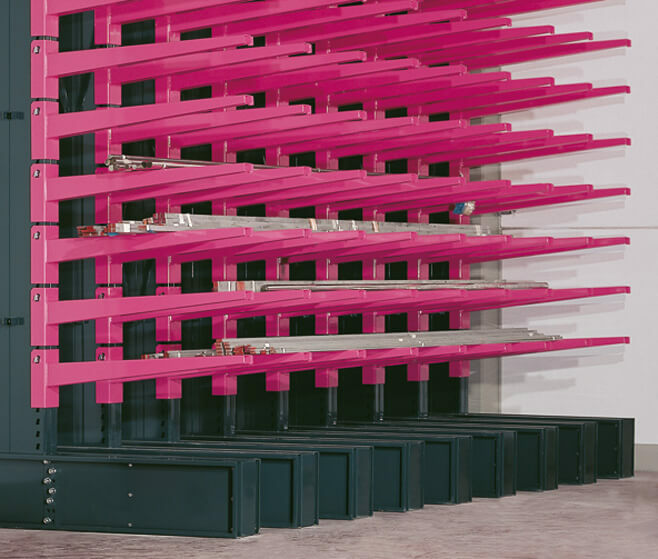 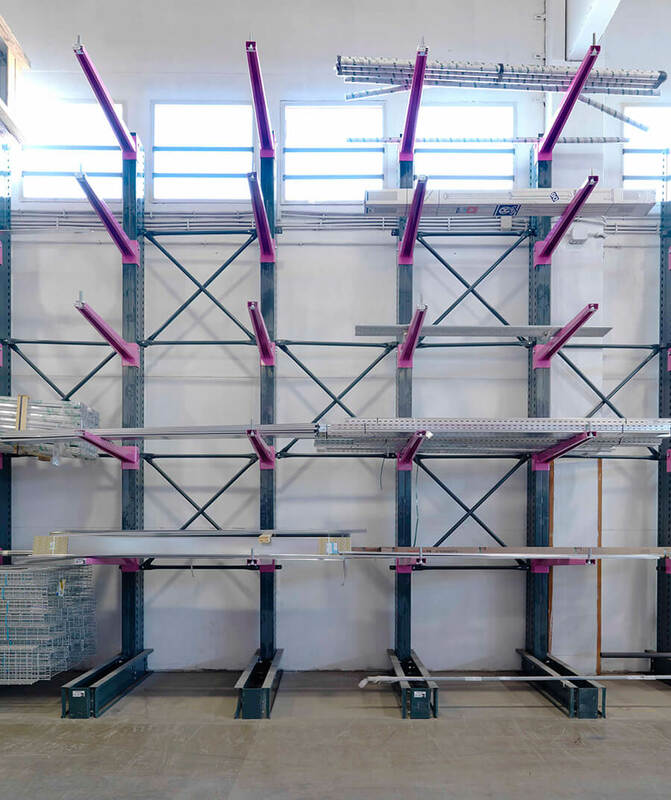 Arms and columns are realized in different sizes and dimensions, so as to easily meet the demands of adaptability to the needs of the cantilever shelf space and inventory management. 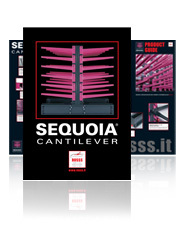 The Sequoia ROSSS arm lock, covered by an exclusive patent, it is made through molding instead of by extrusion: this allowed to model its shape obtaining new and higher performance because the groove created in its area of contact with the structure allows a greater stability of the structure. 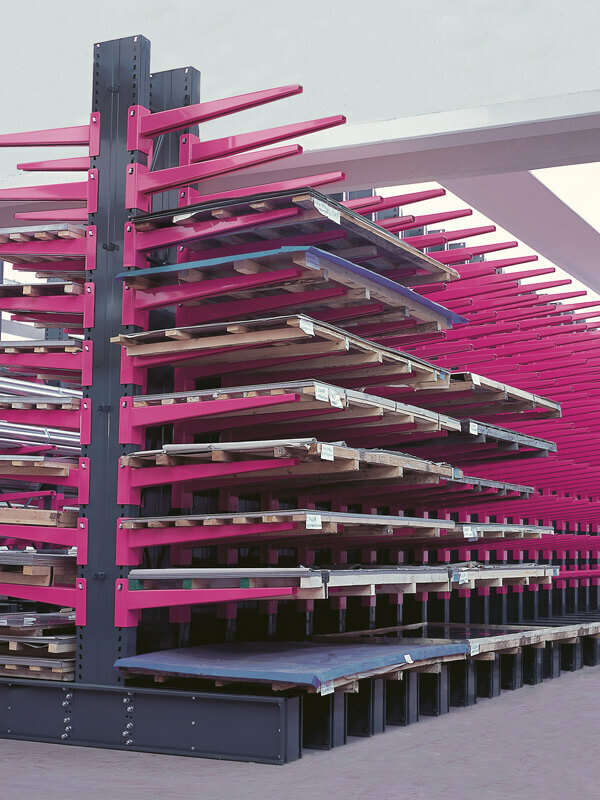 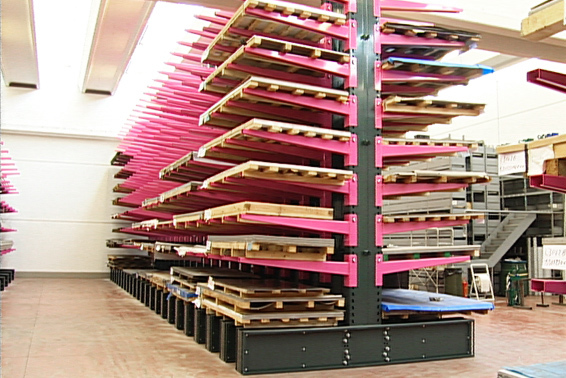 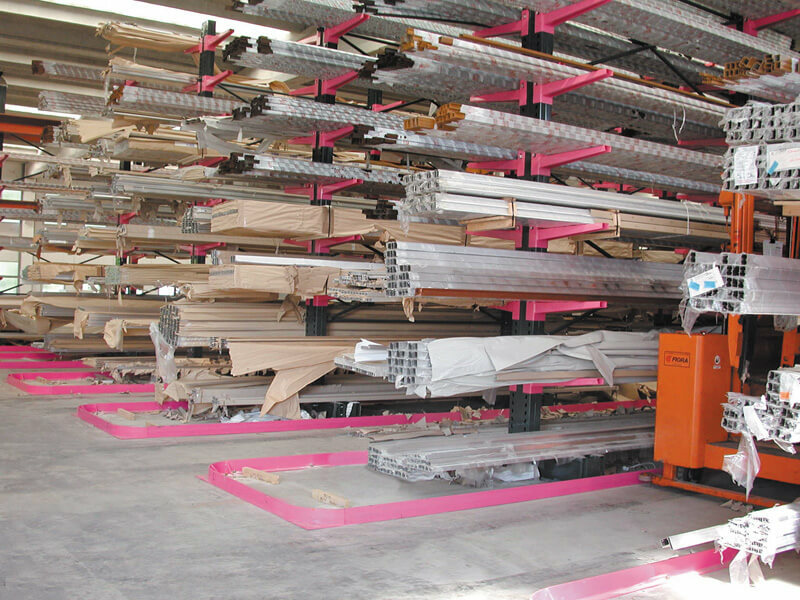 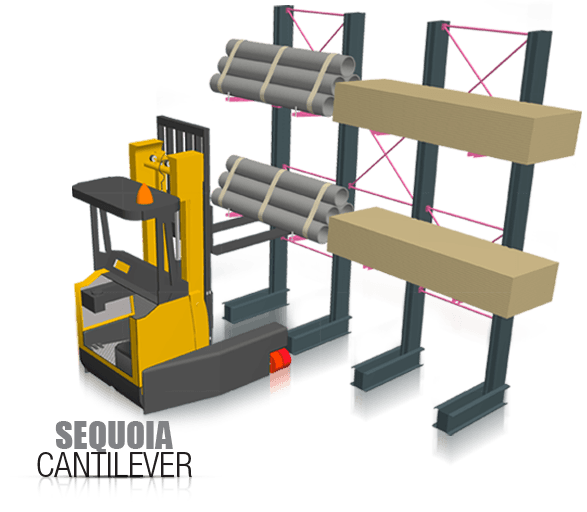 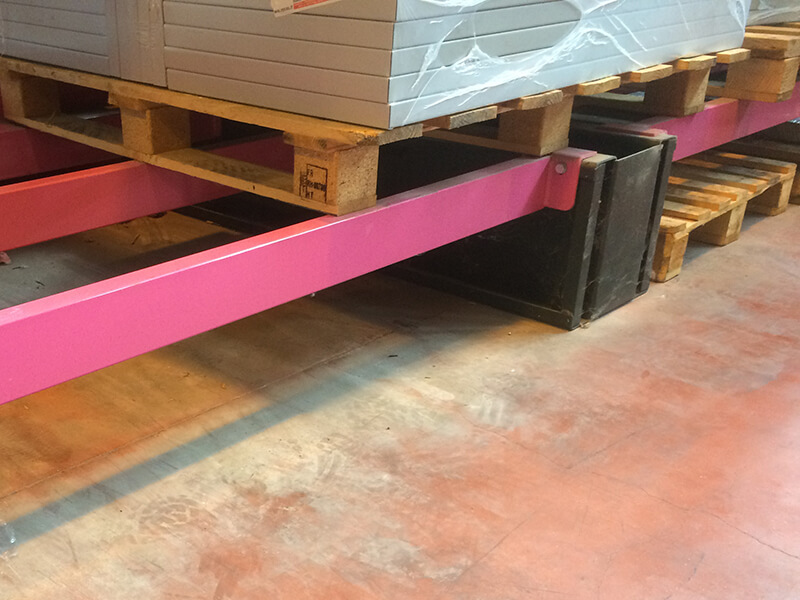 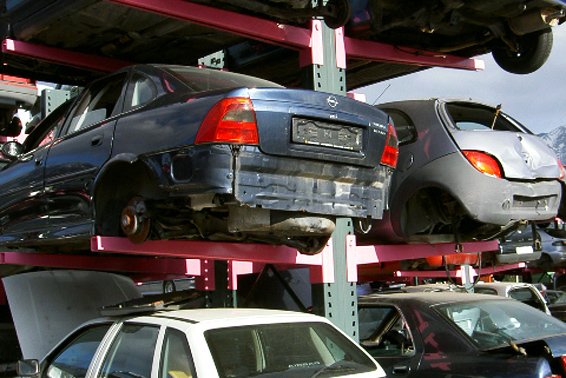 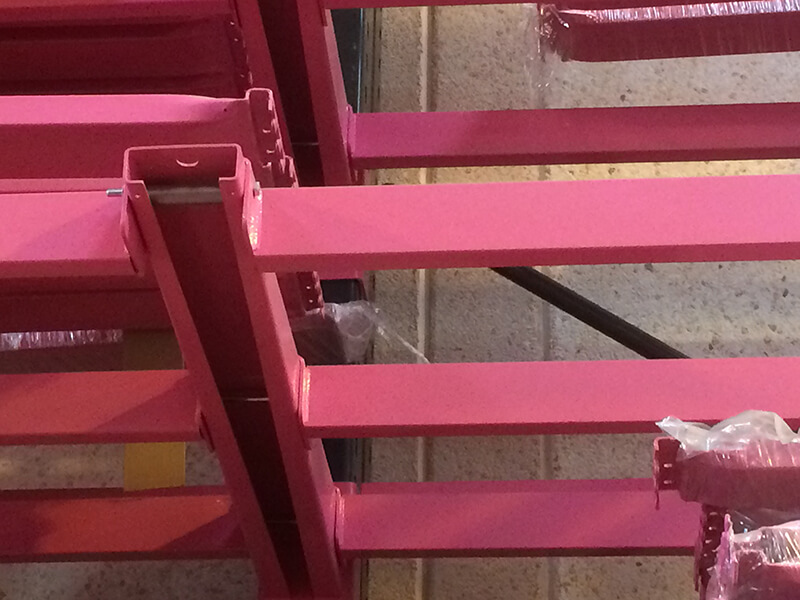 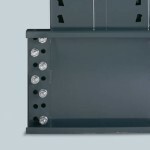 If you need to store heavy and bulky loads, configure your plant using ROSSS cantilever. 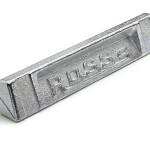 The cross bracings that constitute the SEQUOIA ROSSS diagonals have a diameter of 42 mm, against the smaller pipes or other types of open profiles. Base and column are held together by bolts. 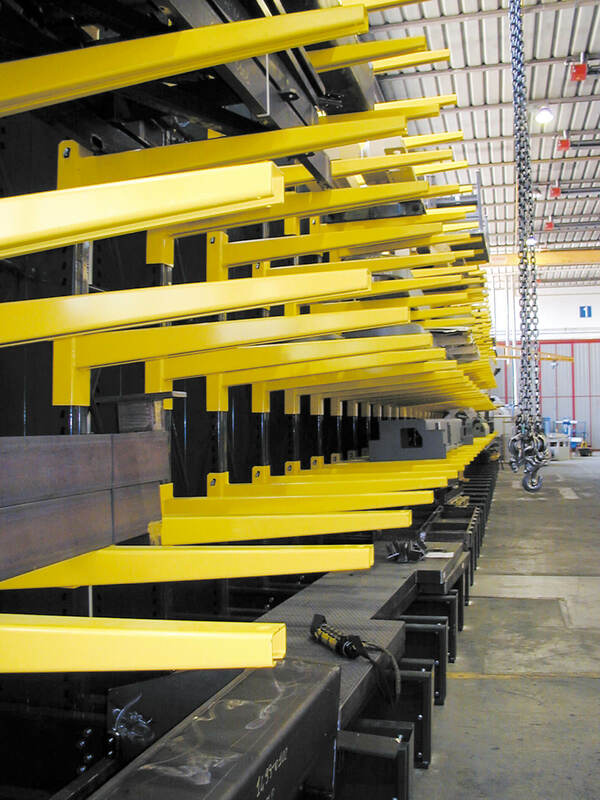 The firm hold their fixtures is critical to the safety of the entire system. 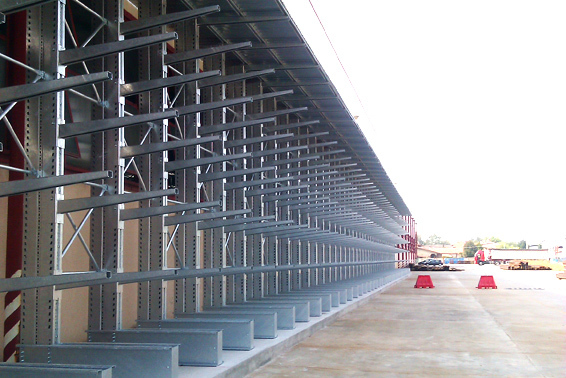 The base of the cantilever is the element on which you unload the vertical forces of the entire system. 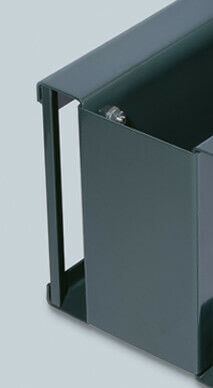 It is therefore an essential element for safety. 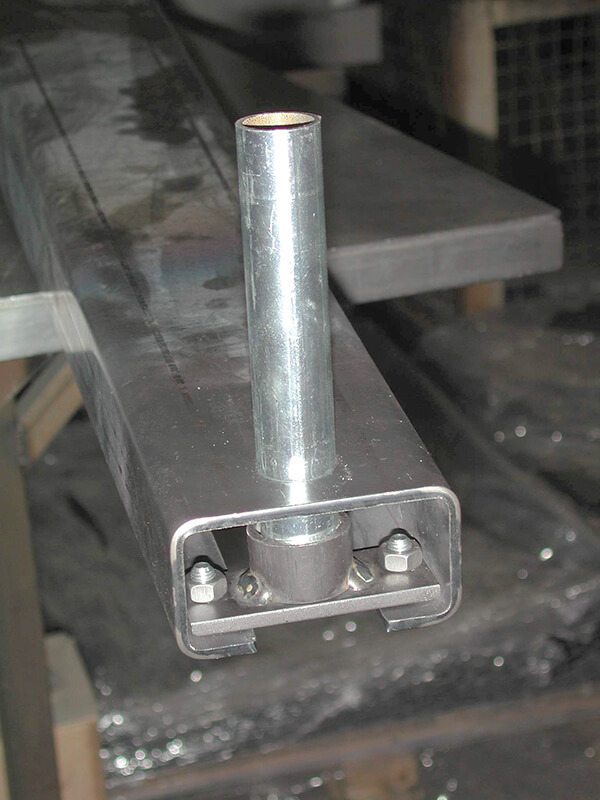 The arm lock (or fixing plug) of the traditional cantilever systems, does not have elements that can surely avoid the slipping in case of stress. 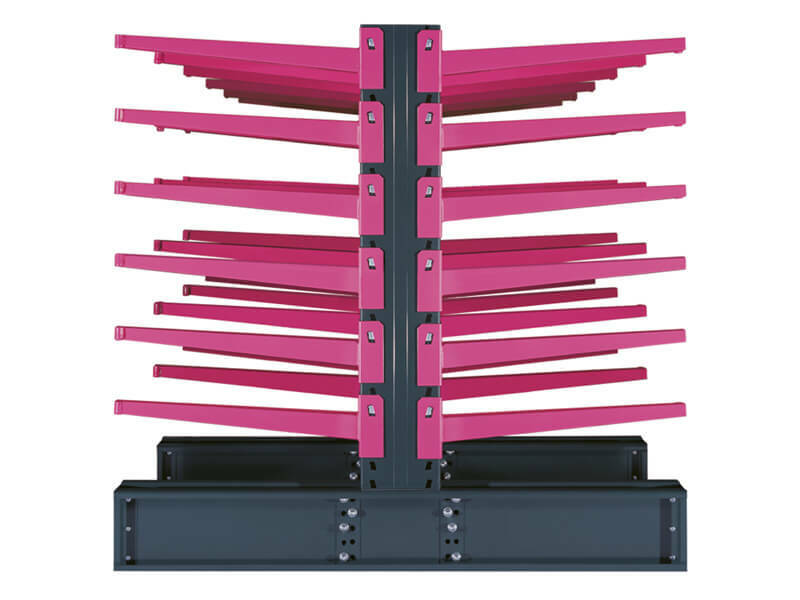 It can come into contact with moving parts. 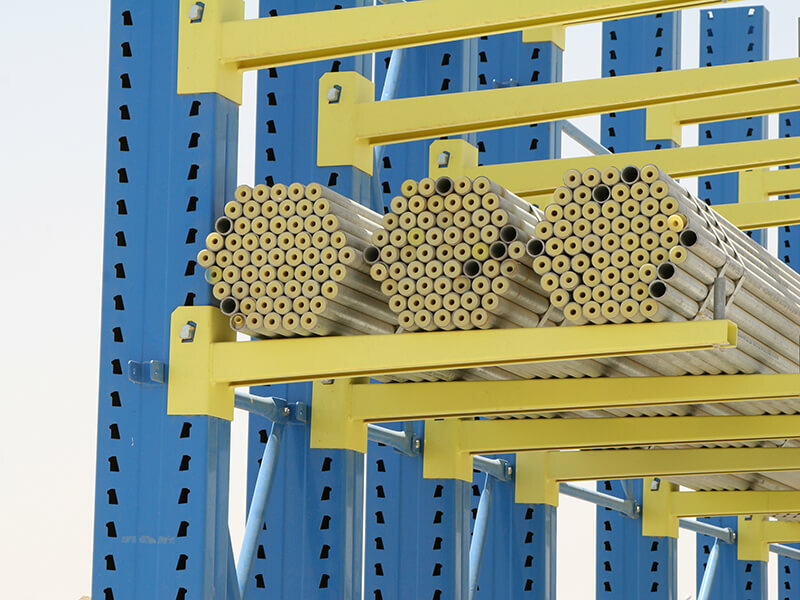 The columns and all the other elements of the system are held together by special cross vaults, which therefore play a major role in the stability of the entire structure. 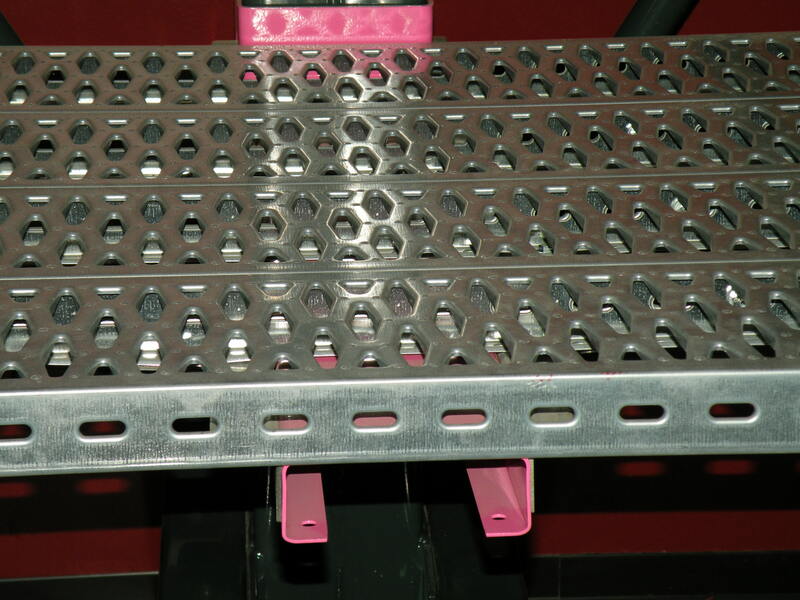 The front plate of the base was welded using a system that avoids the formation of protruding elements which can create problems when handling goods on the base. 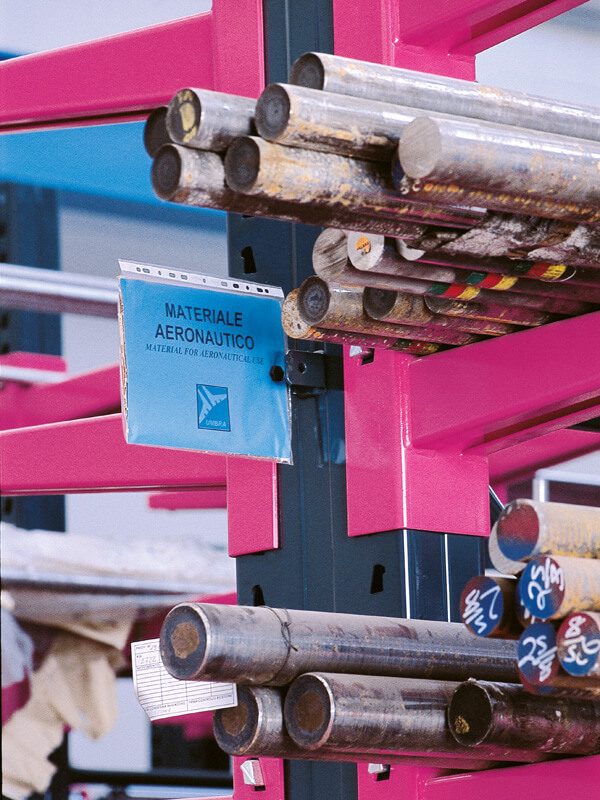 On each arm there are three holes, as standard, where an anti-fall pin can be inserted, expedient that may be necessary for greater safety in the storage of certain materials and products. 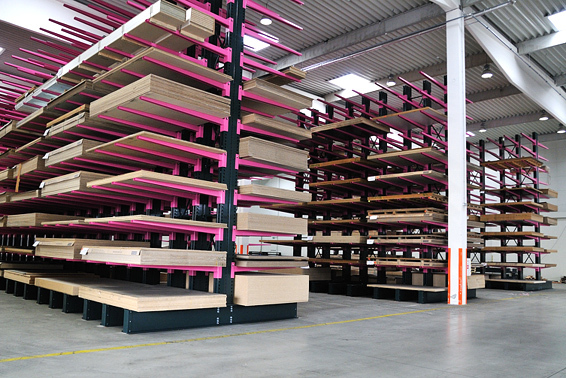 SEQUOIA ROSSS uprights are made with six types of profiles. 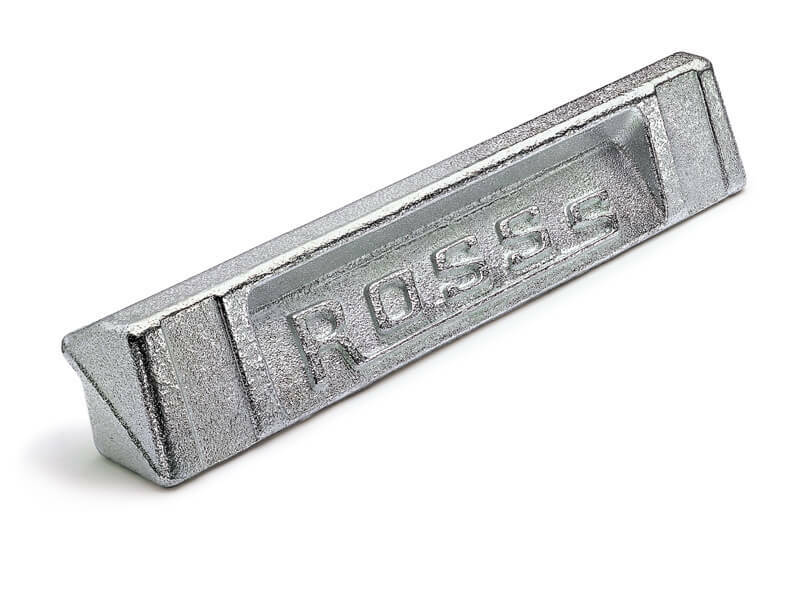 The SEQUOIA ROSSS arm lock is made with a production system which is covered by the exclusive ROSSS patent, by molding rather than by extrusion. 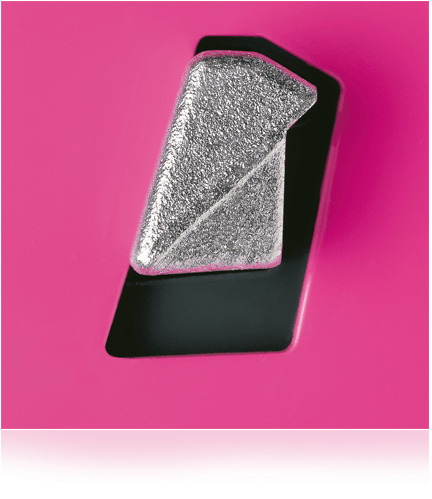 This allows to model its shape, achieving new and higher performances: the groove created in the contact zone with the structure allows greater stability. 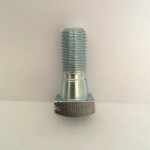 Conical bolts which tend to self-lock which are also oversize (threaded part of 16 mm and 17 mm body, against smaller traditional sizes). 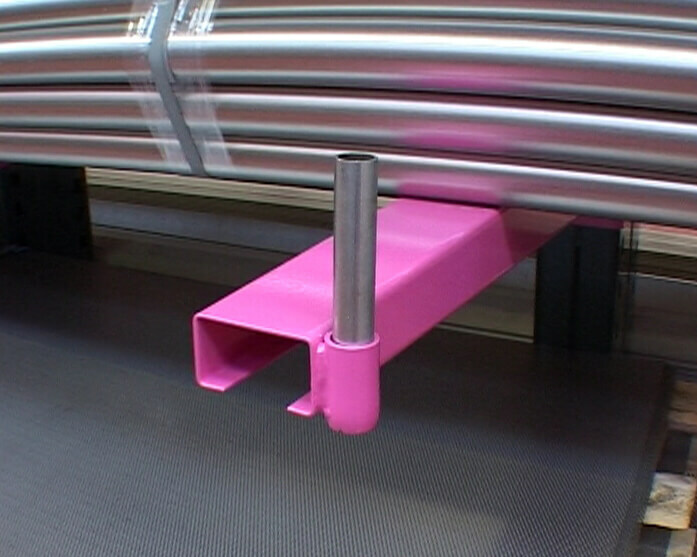 From the anti-fall pin to contrast runners choose the right accessory for your cantilever. 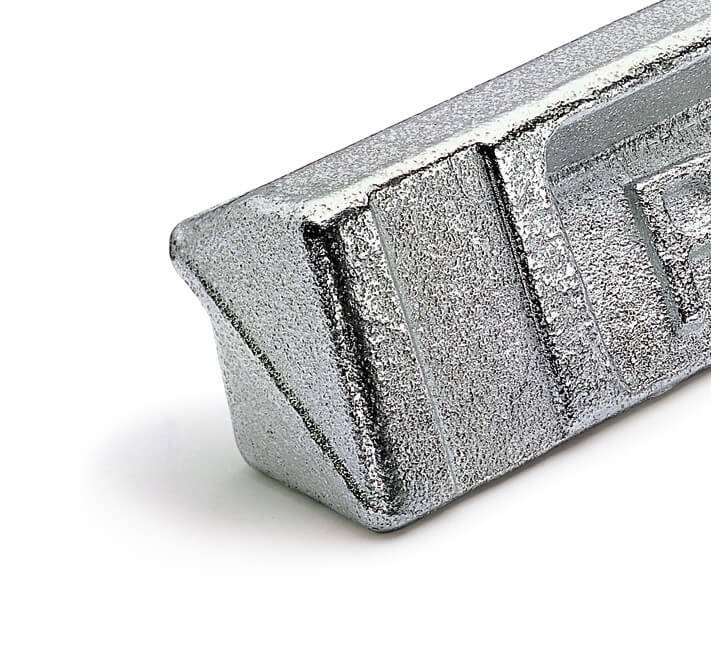 The steel used for the realization of the braces is of 3.1 certificate structural type, S 235JRH, with minimum unit yield stress of 235 N / mm2 and minimum elongation at rupture of 24% . 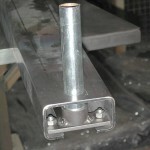 The product is obtained from tubular bars, by means of welding and subsequent painting. 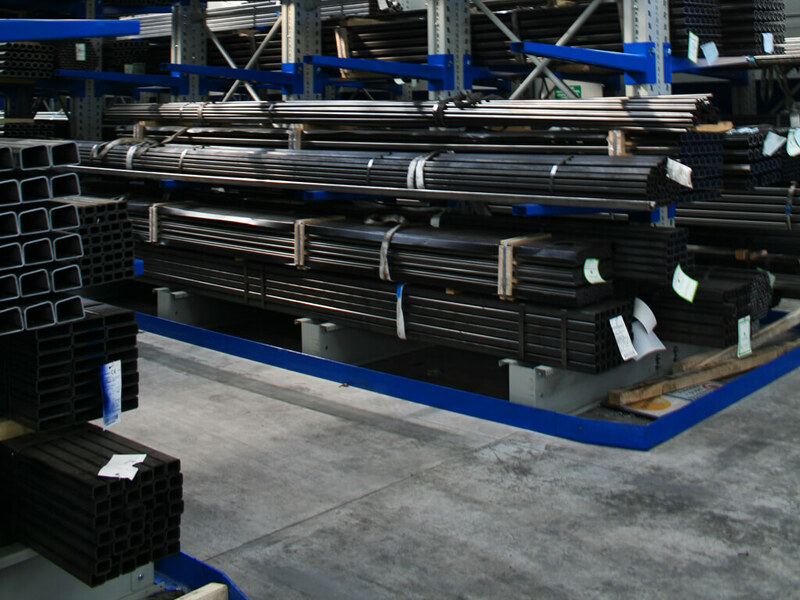 The steel used for the realization of the arm locks is 3.1 certificate structural type, S355JR with minimum unit yield stress of 355 N / mm2. 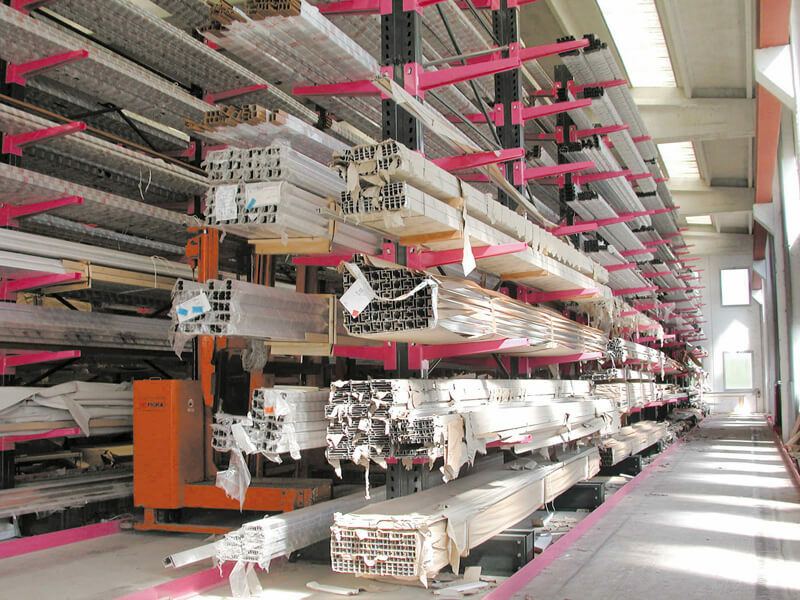 The product is obtained by molding and hot-dip galvanizing. 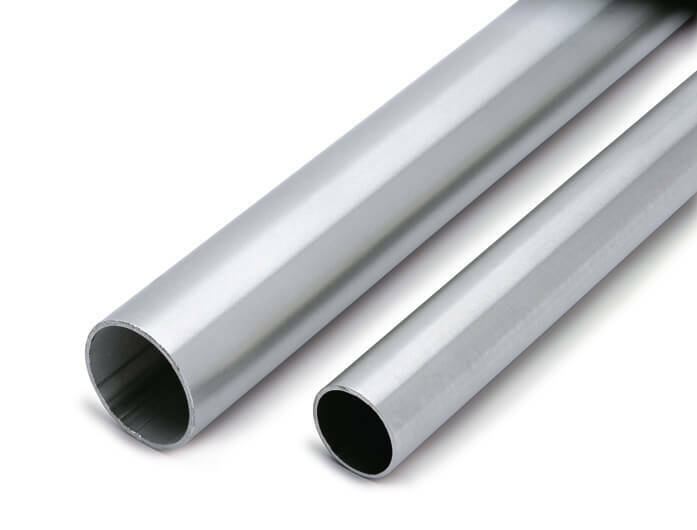 The steel used for the realization is 3.1 certificate structural type., S 235JRH, with minimum unit yield stress of 235 N / mm2 and minimum elongation at rupture of 24% . 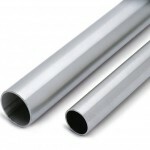 The product is obtained from tubular bars, by means of welding and subsequent painting. 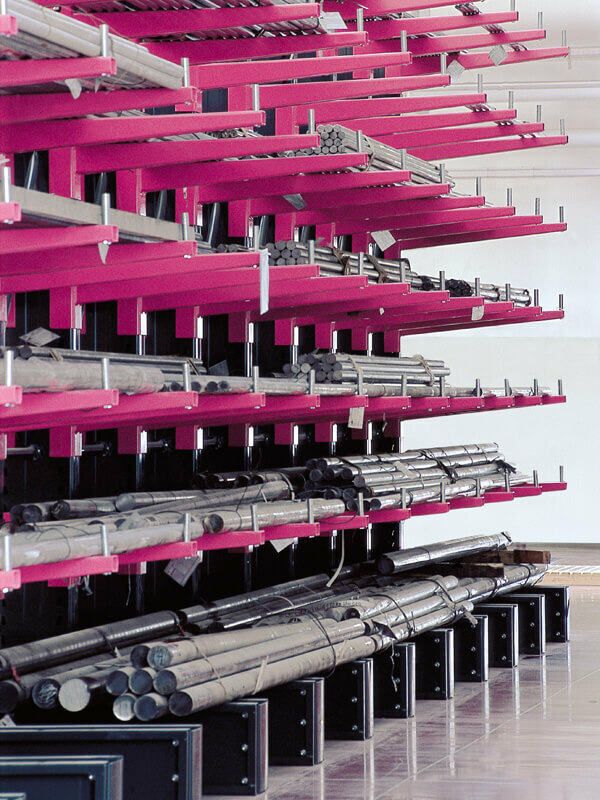 The steel used for the realization of the arms is 3.1 certificate structural type, S235JR with minimum unit yield strength of 235 N / mm2. 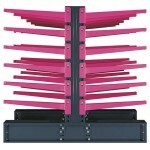 The product is obtained from pickled coils, by folding and subsequent painting. 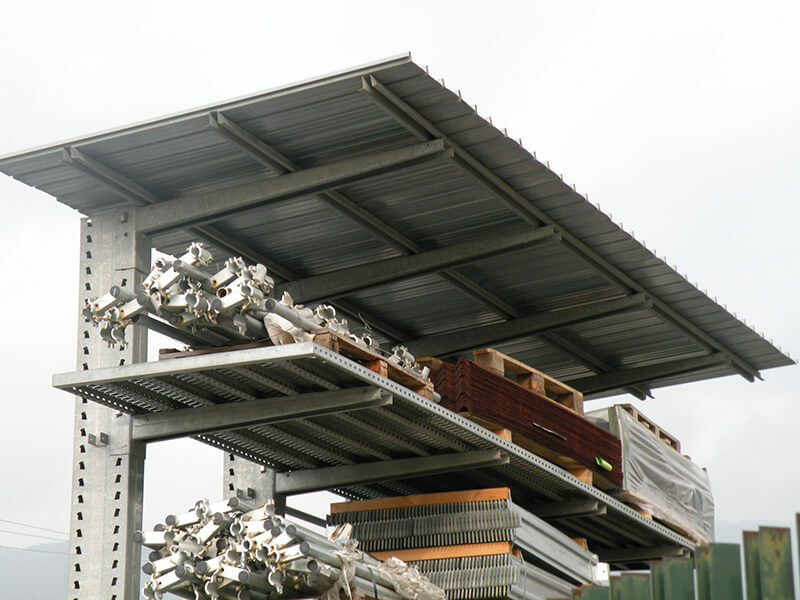 The steel used for the realization of the bases is 3.1 certificate structural type, S235JR with minimum unit yield stress of 235 N / mm2. 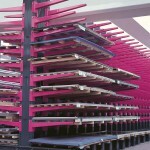 The product is obtained from pickled coils, by folding and subsequent painting. 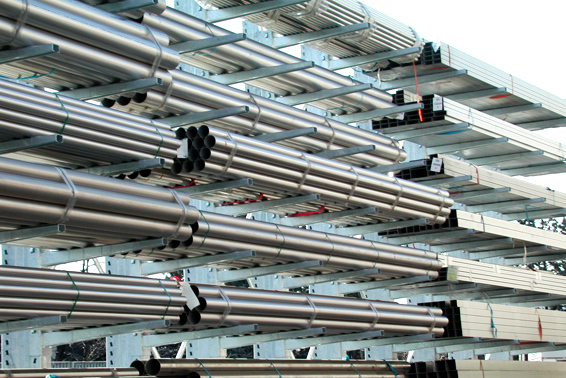 The steel used for the realization of the columns is 3.1 certificate structural type, S 235JR with the addition of Niobium, with minimum unit yield stress of 235 N / mm2. 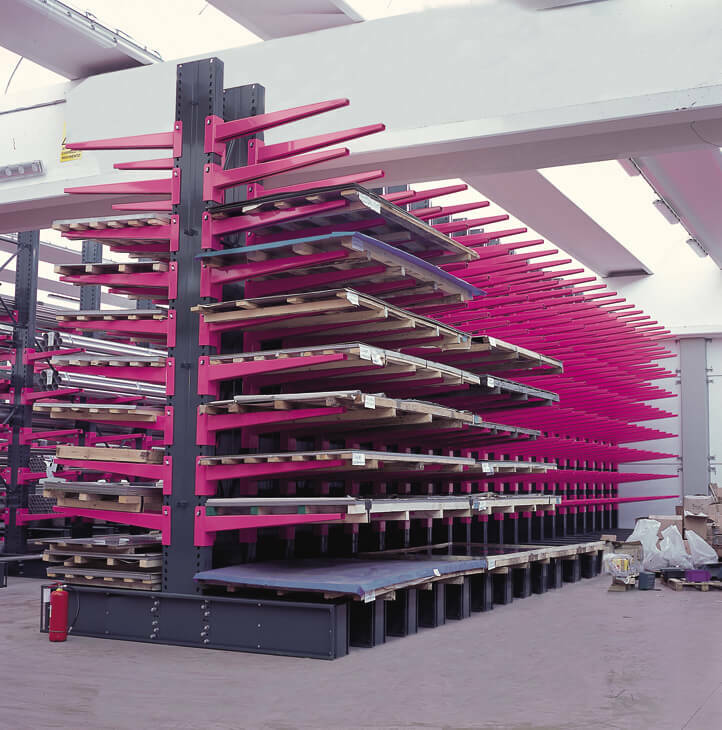 The product is obtained from pickled coils, by folding and subsequent painting.